Pollen + grace create deliciously healthy food-to-go free from gluten, wheat + dairy. With a focus on using only 100% natural, wholesome ingredients, each product is completely free from preservatives and artificial ingredients and is curated alongside their in-house naturopath to create a nutritionally dense, complete meal. We believe that food should make you feel beautiful inside and out, which is why all of our products are nutritionally designed to help you heal, thrive and feel the best that you possibly can. We make everything fresh every day from 100% natural ingredients, from our mylk to our hummus, so that you can enjoy food as it should be. Fresh, delicious, beautiful – and made with love. 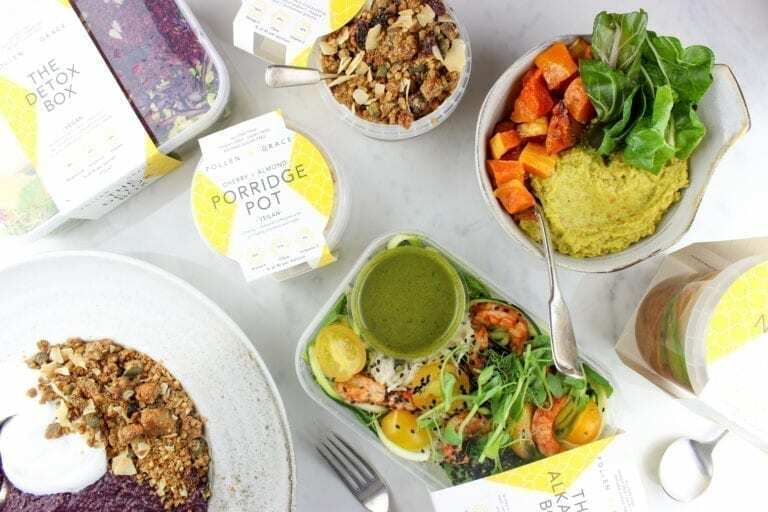 Founded in March 2015 by Stephanie Johnson & Kristina Komlosiova, Pollen + Grace started in a home kitchen as a lunch delivery service, with a daily changing menu and a small number of customers in local offices. Fast forward 2.5 years, and we’re now a retail company creating over 5000 fresh products a week from a range of 17 products. With every product still made by hand by our team of 8 chefs, our aim stays the same: to make free-from, healthy options exciting, appealing and accessible to all.